Looking for a decadent treat? This indulgent, red velvet ombré is sure to please even the pickiest of clients. Wanting to know the details, we reached out to coloristRachelle Mariano from Titanium Studios Salon in Vancouver, who happily shared her formula. 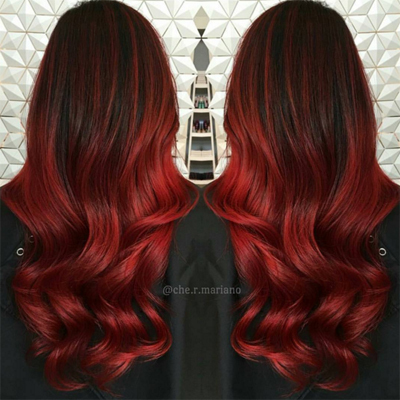 “I wanted to make sure my client stood out, so I created this deep scarlet blend,” said Rachelle. Well, Rachelle, mission accomplished! Here’s how she did it. 1. Using Formulas A & B, balayage throughout the entire head using foils for extra lift, while still keeping a high contrast blend on both ends. 2. Process for 20 to 30 minutes without heat. Then rinse, shampoo and towel-dry the hair. 3. Apply Formula C from roots to ends and process for 20 minutes. 4. Rinse, shampoo and condition the hair. Style as desired.